Book a Meeting Easily With Our App! Taking advantage of executive and coworking office space makes sense for all types of professionals including freelancers, entrepreneurs, and business owners. However, choosing the right location to conduct your work or host your meetings is important. South Charlotte is the perfect place for your business meetings. Located in the upscale Ballantyne neighborhood of Charlotte, YourOffice-Ballantyne is designed to provide you with professional, affordable meeting space that’s ready to use. When you need affordable office space in South Charlotte, consider the executive suites that YourOffice Ballantyne offers. With a location everyone can enjoy, having a flexible office arrangement has never been so convenient in this part of town. 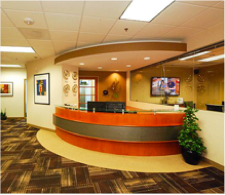 Whether you need a professional office space for an hour or a month, YourOffice-Ballantyne has you covered. How can you make your meeting more impactful? You want your meeting space to be comfortable for your audience but also customize the configuration based on what you need. Fill in your details and we'll get back to you fast! Call 704.944.3200 for an OfficeTour. Let us know your business goals and we’ll deliver the workspace plan to help get you there.